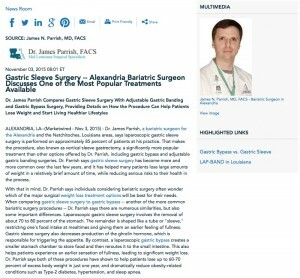 Dr. James Parrish compares gastric sleeve surgery with adjustable gastric banding and gastric bypass surgery, providing details on how the procedure can help patients lose weight and start living healthier lifestyles. Alexandria, LA – Dr. James Parrish, a bariatric surgeon for the Alexandria and the Natchitoches, Louisiana areas, says laparoscopic gastric sleeve surgery is performed on approximately 85 percent of patients at his practice.. That makes the procedure, also known as vertical sleeve gastrectomy, a significantly more popular treatment than other options offered by Dr. Parrish, including gastric bypass and adjustable gastric banding surgeries. Dr. Parrish says gastric sleeve surgery has become more and more common over the last few years, and it has helped many patients lose large amounts of weight in a relatively brief amount of time, while reducing serious risks to their health in the process. With that in mind, Dr. Parrish says individuals considering bariatric surgery often wonder which of the major surgical weight loss treatment options will be best for their needs. When comparing gastric sleeve surgery to gastric bypass – another of the more common bariatric surgery procedures – Dr. Parrish says there are numerous similarities, but also some important differences. Laparoscopic gastric sleeve surgery involves the removal of about 70 to 80 percent of the stomach. The remainder is shaped like a tube or “sleeve,” restricting one’s food intake at mealtimes and giving them an earlier feeling of fullness. Gastric sleeve surgery also decreases production of the ghrelin hormone, which is responsible for triggering the appetite. By contrast, a laparoscopic gastric bypass creates a smaller stomach chamber to store food and then reroutes it to the small intestine. This also helps patients experience an earlier sensation of fullness, leading to significant weight loss. Dr. Parrish says both of these procedures have shown to help patients lose up to 60-70 percent of excess body weight in just one year, and dramatically reduce obesity-related conditions such as Type-2 diabetes, hypertension, and sleep apnea. A gastric banding procedure such as the LAP-BAND® System technique is also designed to help patients lose large amounts of weight, but in a much different way. Dr. Parrish says the LAP-BAND® System involves the placement of an elastic band around the stomach, creating a smaller stomach pouch. The patient is able to feel full much earlier than usual while eating, which can ultimately help them lose weight. The biggest difference between gastric banding procedures and the gastric sleeve procedure, Dr. Parrish notes, is that a gastric banding treatment does not involve any permanent surgical alteration to the stomach. In fact, it’s a completely adjustable and even reversible procedure. Dr. Parrish says, while gastric bypass procedures may be a more effective option for some patients, including those with severe diabetes or conditions such as acid reflux, he recommends gastric sleeve surgery to most of his patients. Dr. Parrish notes that gastric sleeve surgery is often better tolerated and exhibits a slightly better safety profile than gastric bypass, plus it does not involve intestinal rerouting or caloric malabsorption. He says gastric banding also has a number of benefits, but gastric sleeve surgery often leads to a faster and larger rate of weight loss and can be better for patients with high body mass indexes (BMIs). Overall, Dr. Parrish says, the important thing to remember is that there are advanced techniques available to help patients who are suffering from the devastating physical and emotional consequences that morbid obesity can cause. He advises individuals considering weight loss surgery to consult with an experienced bariatric surgeon, view before-and-after photos and learn from other patients about their experiences, and thoroughly discuss their options to determine which type of procedure is best for their unique needs and goals. Dr. James Parrish is a board-certified General Surgeon and a Fellow of the American College of Surgeons. He is a past President of the Louisiana Chapter of the American Society for Metabolic and Bariatric Surgery. Dr. Parrish also serves as the Medical Director of Bariatric Surgery at Central Louisiana Surgical Hospital and Christus St. Francis Cabrini Hospital. Dr. Parrish has performed hundreds of bariatric surgery procedures, and offers a comprehensive weight loss surgery program at his practice in the Alexandria, Natchitoches, and Natchez, Louisiana area. Dr. Parrish is available for interview upon request.